Coenzyme Q-10 occurs in cellular mitochondria throughout the body and is essential to their function and for ATP production. The areas of highest energy metabolism, including the heart and skeletal muscle, depend heavily on CoQ-10 for normal function and antioxidant protection. CoQ-10 levels decline with aging, and endogenous synthesis levels can also fall behind during times of high energy output, as well as in some disease states. A rapidly growing body of research has confirmed the participation of CoQ-10 in maintenance of blood pressure homeostasis, cardiovascular and brain function, and oral tissue health. 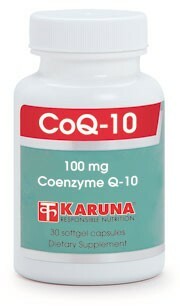 All Karuna CoQ-10 products are presented in softgel capsules with vitamin E, as research strongly emphasizes that CoQ-10 needs a lipidsoluble medium for greater absorption and bioavailability. Note the selection of milligram amounts and softgel capsule counts for dosing flexibility. Increasingly, higher doses of coenzyme Q-10 are being shown to have superior effects. This formulation provides 100 mg per capsule, necessary in particular to achieve doses for optimal cellular health, immune system activity (Biochem Biophys Res Commun 1995;212:172-7), and normal heart (Am J Cardiol 1985; 56:247; Clin Investig 1993;71:S134-6) and brain function (Arch Neurol 2002; 59:1541-50). 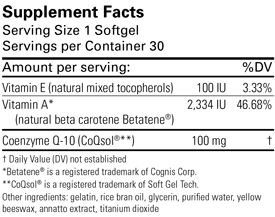 Suggested use for adults: 1-2 softgel capsules daily taken with meals, or as directed.